This recipe comes via my friend Noel. He is like my own personal food reviewer. He has a zillion cookbooks and always tries out recipes before I do. Is it GREAT? just OK? or DON'T BOTHER. I rely on his reviews before I jump in. He recently served this salad at a dinner party and everyone raved. I tried it for myself and this salad is a 10. It's good enough for lunch, and nice enough for a first course at your next dinner party. It's a hit. I changed the recipe a bit by using roasted cauliflower instead of blanched, (because I made some roasted cauliflower last night!). I also soaked the shallots in the vinaigrette to get rid of the bite and plated it just before serving. I used a little less butter than the recipe called for too. You can be flexible with this recipe, by adding a bit more of this or that, because I think it's the butter, honey and vinegar that makes the cauliflower mouth smacking delicious (and the bacon doesn't hurt either!). Whisk the dressing ingredients in a small bowl, letting the shallot sit in the dressing, while you put the rest of the salad together. Fry up your bacon lardons until crisp. Drain on a paper towel and set aside. Wipe out the oil in the skillet and add the butter. On medium-low heat, add the teaspoon of honey, the tbsp of red wine vinegar to the butter and the cauliflower pieces. 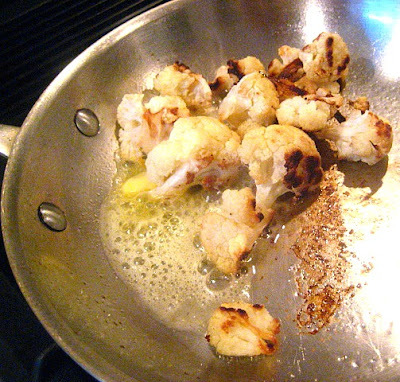 Toss the cauliflower until it is coated with this yummy glaze, about 5 minutes if you are using blanched cauliflower so it gets browned, 2 minutes if you are using roasted cauliflower. 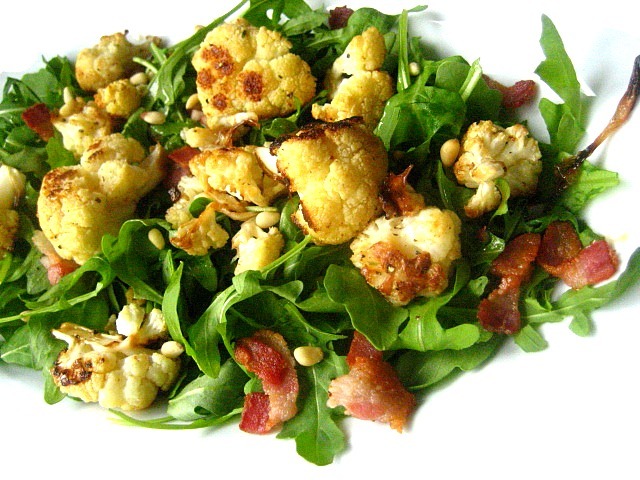 On individual plates, lay out the arugula and bacon and drizzle with the dressing. 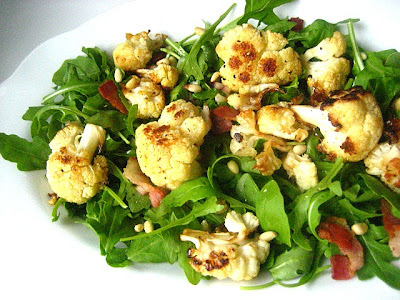 Spoon some of the glazed cauliflower on top of each salad and sprinkle w/ pine nuts. Season w/ sea salt and pepper if you like. PS and a happy birthday to my wonderful taste tester husband! He's the B-E-S-T! This sounds supper yummy, Sta! Happy Birthday to Henry!!! This is so different, I love the combination, and no carbs, I'm in! Happy Birthday Henry! I don't think we've wished Henry a happy birthday via your blog but why not? Happy Birthday youngest son... and many more. You lucked out with Sta. Looks delcious! Happy Birthday to Henry! I've been making the same cauliflower salad once a week for two months. Do you sense overkill? My family will thank you when I present this over the weekend. Arugula and bacon? Hell, yes. And Happy Birthday to your very lucky taste-tester. I wholly approve of your choice to go with roasted cauliflower...it's the best. I love this salad! This is a lovely thing and one I MUST try. I eat salads all the time, but usually just boring greens, nothing as interesting as this. Need to make more for the blog too, I think I've only done 3.....such a bad boy. I think Noel and you landed on three of my favorite foods -- bacon, arugula and bacon. Sounds like just a delightful salad. Filed away, dinner party or no.